The Fairfax County school board is expected to consider a proposal to change the name of JEB Stuart High School, as a growing number of students and alumni oppose having a school named for a Confederate general. School renaming proposals throughout the county are gaining momentum in the wake of the recent murders in an African American church in South Carolina by an avowed racist who identified with the Confederacy. That shooting led to the efforts to remove the Confederate flag from Southern state capitols and license plates. School board member Sandy Evans, who represents Mason District, agreed to “help facilitate a thoughtful conversation” on renaming Stuart with parents, students, alumni, teachers, the PTSA, student government, area civic associations, community members, and all interested stakeholders. “I was very impressed with the group of Stuart students I met with recently who are interested in pursuing a name change for Stuart and appreciated the research they’d done and the thoughtfulness with which they approached their advocacy,” Evans says. A video by Anna Rowan and other Stuart students who support the name change is on You Tube. “I’ve heard from other individuals who believe a change is warranted, while others have told me they support keeping the name,” Evans says. An online petition by Stuart Alumni for Change to rename Stuart has so far gotten 1,120 signatures. An old Stuart HS logo. A similar online petition created by Amanda Miller of People Demanding Action and Lake Barcroft resident Stephen Spitz urges the school board to rename Stuart for Thurgood Marshall, the first African American Supreme Court justice. 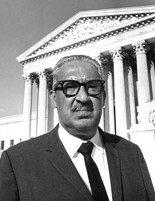 Marshall had previously argued for school integration in the landmark Brown v. Board of Education case in 1954. Meanwhile, 1,902 people signed a counter petition to retain existing names of Fairfax County schools. Many of those who signed are FCPS alumni who cite the need to preserve tradition and history. Alumni for Change was launched by Lisa McQuail (Stuart Class of 1978) and Jeff Parker (Stuart Class of 1975). Parker, a historian, reports that the decision to name Stuart High School for a Confederate general, James Ewell Brown “JEB” Stuart, was made during the late 1950s when Virginia officials were carrying out a policy of “massive resistance” against racial integration. Hollywood film director and producer Bruce Cohen (“American Beauty”), who graduated from Stuart in 1979, is the president of Alumni for Change. Director Tom Shadyac (“Ace Ventura”), a 1975 graduate, has joined the campaign, as has the Fairfax County NAACP chapter. McQuail, who is white and counts several Confederate soldiers among her ancestors, refers to the Confederate imagery during her years at Stuart in the 1970s as “a pageant of hate.” There were Confederate flags on football uniforms, and every time Stuart scored a touchdown, someone dressed as a Confederate soldier rode around the stadium, she says. There was a perception that black kids were only tolerated because they were good at sports and were not eligible for the homecoming court, talent show, or other activities, McQuail recalls. By 1974, there was a black history club, and its efforts to create a float for the homecoming parade (featuring Hannibal crossing the Alps) were met with ridicule by white students, she says. That led to “a race riot,” and police brought in reinforcements to quell the violence. A psychotherapist was subsequently assigned to the school to help reduce racial tensions. “That helped, but it wasn’t quite enough because so much damage had already been done,” she says. While the Supreme Court outlawed segregation in 1954, Fairfax County public schools weren’t fully integrated until the early 1970s. At the time, a slew of white-only private schools were developed, while school officials, including then-Superintendent W.T. Woodson, fought against integration. While the Alumni for Change petition currently calls for renaming all FCPS schools named for Confederate generals, such as Robert E. Lee High School, or segregationists, like Woodson High School, the group is refining its mission to focus on Stuart. It also supports changing the school’s name to honor Marshall. Marshall lived in Lake Barcroft from 1968 until he died, in 1993, and his widow, Cecilia still lives there. Lake Barcroft is in Stuart’s service area. JEB Stuart, on the other hand, is from what is now West Virginia. Retaining the Stuart name and the Confederate image is “embarrassing and shameful and totally inappropriate for the 21 century,” says Spitz, while renaming the school for Marshall would create “a teachable moment” about Marshall’s role in promoting integration. In response to critics of the name change who say Fairfax County already has a Marshall High School (named for Secretary of State and Marshall Plan architect George C. Marshall), Spitz says“that shouldn’t be an insurmountable obstacle.” To avoid confusion, “call Stuart ‘Justice Marshall High School,’” he suggests, noting that there already are two schools named Bailey’s. Others have raised objections that renaming Stuart would lead to proposals to rename everything else named for a Confederate or slave owner – such as Thomas Jefferson High School, Madison High School, and even Lee Highway. I cannot imagine why anyone would want to commemorate J.E.B. Stuart. In contrast to nation builders like Washington, Madison, and Monroe, Stuart's accomplishments were destructive and, in hindsight, largely regrettable. Other than appealing to the sensibilities of misguided adherents to the myth of the "Lost Cause", there is simply no good reason to name any public building after him. It's high time the Commonwealth put its sad secessionist history behind it. If these guys want to gain more support they should probably ditch that dumb tagline, "pageant of hate." How about FCPS/Fairfax County try and work on closing the overall achievement gap between Stuart and other FCPS high schools? Stuart is plagued with problems - its name is the least of them . I am 100% in agreement with you. Put the time and effort into helping the students not changing the name of the school. Adam--not sure that's a tag line or just a phrase from the interview that appears twice in the article. It's time for a change. Well past time, actually. The "heritage" some cling to is either the treason of the Civil War, in support of slavery, or the massive resistance of Virginia post-Brown v. Board of Education. Each new graduate--more than half of them non-white--of that school ought to go away with a diploma that doesn't bear the name of JEB Stuart and the history he represents. Stuart HS is incredibly diverse and many of its students and their families come beyond our borders. Thurgood Marshall was a wonderful figure but already has a high school named after him in the district. How about naming the high school after someone who has ties to so many of the diverse students, perhaps Bartolome de las Casas who even in the 16th century knew that the so-called "indians" were people and deserving of basic human rights, or Simon Bolivar, a freedom fighter in Latin America that liberated so many countries from the oppression of Spain at the time. Or, since it is a high school and a place of learning, perhaps Miguel Cervantes, who is the equivalent of Shakespeare in Spanish. The posibilities are endless and I for one would love to see the heritage of so many of our diverse students reflected in at least one high school. Are you kidding me. Name a school in the US after someone from a different country. Is this for real or a joke? You can not find a name of a famous American? How about Lincoln? Marshall HS is named after George Marshall. Hence the mascot is The Statemen. How inane to have two schools named Marshall. What a ridiculous idea to call it Stuart Justice Marshall. History is History. Grow up and get over it. No one in the current school at JEB Stuart feels discrimated against because of the name of the school and if they do it is because someone put it in their head to feel that way. I think the current JEB students--and I've talked to some of them about this issue--deserve a lot more credit than "they don't care and if they do, someone else planted the idea." They do very much care, and they know how the name came to be. I suggest you find some and talk to them, rather than dismissing them. You might learn something. Even if you still disagree, I hope you'd walk away with more respect for their position. I'm ambivalent about what the name should be. It shouldn't be JEB Stuart. My great great grandfather rode with JEB Stuart. I like that there is a high school named after him. Political correctness run amuck. Next thing you know we'll have to get rid of every reference to George Washington and Thomas Jefferson because they owned slaves. The references to Washington and Jefferson endure because they founded our nation. In contrast, Stuart, Davis, Lee et al. attempted to destroy it. I feel confident in saying that most of us are grateful they failed. There's nothing noble about J.E.B. Stuart. He may have achieved some early notoriety, but his later exploits were hardly successful. He only avoided the harsh judgment of history because of his relatively early death. Conversations like this arise because the Great Rebellion was too widespread for the federal government to deal with in the traditional manner. Instead of hanging the perpetrators, their crimes were forgiven. Unfortunately, this magnanimous gesture backfired when the perpetrators chose to respond by creating the myth of the "Lost Cause". That gesture of defiance and its attendant misery still persists to this day. It's time to put history into its proper context. Confederate icons have no place in our society and its time to eliminate all vestiges of them from our landscape. Stuart, Davis and Lee were attempting to found their nation on the same principles as Washington and Jefferson, to wit: freedom from the tyranny of a government they didn't agree with. Washington and Jefferson won; Stuart, Davis and Lee lost. Lee is one of the most noble of all Americans. Aside from Lincoln, the other true giant of the Civil War. He fought brilliantly for the State he believed in (not necessarily the cause), surrendered his army when all was lost (he could have conducted guerrilla warfare for decades) and went on to become a distinguished college president. Lincol was magnanimous, but so was Lee. Also, contrary to your statement, many, many Confederate soldiers were hung for fighting for their country. Ninety five percent of the Confederate soldiers did not own slaves. They weren't fighting for slavery, they were fighting for states rights and the right to govern themselves. Times change, people evolve. Those that forget history, are doomed repeat the mistakes of the past. The name should change not only because of who JEB Stuart was, and what he fought for, but also because it was chosen out of spite in the 1950s in opposition to integration. So your valiant defense of General Stuart does not address all of the reasons why a name change is warranted. Lee's image as a noble Southern warrior is just another manifestation of the false image that was carefully crafted for him as part of the "Lost Cause" myth. He was a Virginian who engaged in bloody fratricide with his countrymen and continued to do so well after any chance of victory had evaporated. There's little doubt he was a brilliant leader. However, I see no reason to celebrate him for lending his murderous talents to undermining the Republic. The whole states rights philosophy was an artifice created from whole cloth by sectional interests who refused to surrender their prerogatives and evolve with the times. As history demonstrates, the generations of southerners who foolishly adopted that line of thinking inevitably found themselves dragged into the present anyway. States rights and the myth of the Lost Cause are inextricably bound. Neither is in the least bit credible. So, it well past time to relegate both to the dust bin of history. Bravo, to the students at Stuart! They had a deep concern, researched the issue, and presented their findings peacefully to the powers that be. We should be proud of their interest. They are the future of America, you know. Researched the issue? Did you watch the video? Two girls (seniors, now grads!) were asked what they knew about J.E.B. Stuart. One of them could only answer that he was a racist, and the other one could only nod in agreement. Another senior correctly stated that Stuart had been killed in battle, but the only other thing he knew was that Stuart had "killed a lot of black people." Really? Pretty serious accusation with no sources, even 150 years later (Perhaps he was confusing Stuart with Nathan Bedford Forrest). These kids all have smart phones in their pockets but could not even be bothered to look up some basic facts on Wikipedia? This doesn't even take into account all the kids who probably answered IDK. If the name is changed, the "concern of the students" makes for a weak argument. There are plenty of Stuart students who are aware of his record and would like to see a name change, even if you found those in the video to be unconvincing. And in light of the economic challenges many Stuart students have, your "they all have smartphones" is certainly wrong, and woefully uninformed about the students you feel are uninformed. Ironic, eh? It sure would be, if it were true. I've spent a lot of time at Stuart and yes, there are students with hard circumstances, but cell phones are ubiquitous. Stop by a class someday and have the teacher ask everyone to take their phones out. You'll see. I want the Fairfax County School Board to rename Stuart in honor of a proud American transsexual who had the guts and "courage" way before Caitlyn Jenner to publicly demonstrate in a respectful (and not grandiose or overly commercial way) to the American people that transgender individuals must be respected, and their rights must be protected from bigots - Chaz Bono. All these people twisting themselves into stupid pretzel shaped knots in a contest to decide who can be the most politically correct are doing nothing but demonstrating their foolishness and egotism. While Thurgood Marshall was a great man he is a terrible choice for renaming Stuart. First, the choice of Marshall is not heartfelt, but rather a choice of convenience. The fact is Fairfax County in general, and Mason District in particular, has demonstrated for over 20 years now it is not interested in honoring the memory of Thurgood Marshall. Does the owner of this blog or anyone commenting on this blog realize that in 1993, the portion of Columbia Pike from Little River Turnpike down to the Arlington County line was named the Thurgood Marshall Memorial Parkway by then supervisor Tina Trappnel? I am guessing NO. Rather than finding another government built and/maintained infrastructure project to name after Thurgood Marshall, the people of Fairfax County and particularly Mason District would show much greater respect to the man's memory by taking down the lousy one or two little rusted green signs on Columbia Pike referring to Thurgood Marshall, replace ALL the street signs, and formally and officially change the name of Columbia Pike in Fairfax County to Thurgood Marshall Memorial Parkway. Doing this will ensure that for generations to come all people who live and travel through Mason District will remember this great man's name. Finally, the name of Stuart HS should be changed to a name that will have more relevance and meaning to current and future high school age young adults. The battle to eliminate discrimination and outright violence against transsexuals is still being fought TODAY. Rather than renaming Stuart HS in honor of a man who has already been greatly honored by the people of Mason District (though more can and must be done as noted above) for events that took place over 60 years ago, the School Board should use its brains and its guts and name the school after a person who exemplifies the fights for civil rights that are ongoing in America today. The fight for equal rights and equal protection for transexuals must be recognized and supported; especially by the younger and future generations of Americans. In the way he came out to the American people, with a quiet dignity, free from all the false hoopla and pomp surrounding modern day "heroes" such as the ESPN Arthur Ashe "Courage" Award winner Caitlyn Jenner - Chaz Bono deserves to be honored and recognized as a fine role-model for our many young adults who are facing their own searching questions about their gender; and who for too long have been stigmitized and subject to abuse and ostracism. The Fairfax County School Board in renaming Stuart HS has the opportunity to transform Mason District, but only if it moves beyond the stupefying racial conflict that some people want to never end; and instead leans forward into a brighter future where more and more Americans who were previously persecuted, ridiculed, and forced to live a lie; can now be free to live the life they know they were born to live. I graduated from Stuart a couple of decades ago and can tell you that even then, we saw the irony of our school being home to so many people who would have given JEB Stuart the shivers, and while many of us (including us white folks!) took cheeky pleasure in that, we also thought about how to reconcile the juxtaposition. Obviously, we didn't get far. We saw the common sense of naming a school/team/whatever after someone considered brave/strong and of relevance to our local history, and we didn't have much of a voice anyway (without older generations backing us up), so we let it be. However, time passes and things change--it's only natural. If the community wants to re-name the school, so be it!! It's important to remember and learn from the past, but it's also stupid to stay willingly mired in it. We can recognize our nation's history and still move forward, if we're smart enough to actually life our lazy feet. Regardless of what comes of these efforts, I'd like the whiners here, there, and everywhere to recognize that sometimes what you poo-poo as being politically correct is actually just basic respect and decency. Some people are flinging the "PC" card as mindlessly and frivolously as others drop the "race card," and I don't care for either practice one stinking bit. Hear hear! Totally agree with you! Sometimes being PC goes too far, but sometimes it is indeed the right thing to do. Thank you! And sometimes being "Politically Correct" is really just being CORRECT! Never mind the name of the school! It has come to my attention that one of the minions is named Stuart. In a few short weeks, hundreds of elementary school students will return to school with minion backpacks, unknowingly (or not?) honoring the Confederacy. School Board, we call on you to pass an emergency measure to ban Minion backpacks in FCPS. If that Minion is named "JEB Stuart," then sure. But if not, you might just want to chill a bit. "Moore said it is reprehensible that the school is named for “a person who fought for the enslavement of other human beings.”"
No, Ms. Moore, what is REPREHENSIBLE is your ignorance. Gen. James Ewell Brown Stuart gave his on the field of honor, defending the Commonwealth. “the evidence of a Savior’s pardoning love…and prayed God to guide me in the right way and teach me to walk as a Christian should.” - GEN J.E.B. Stuart. BY ALL MEANS, let's not have students follow in his GODLY, honorable footsteps. You, Ms. Moore, are not worthy to wipe his boots.